CAMBRIDGE, MA – Homeowners are expected to increase spending on improvements and repairs at a solid clip over the coming year, according to the Leading Indicator of Remodeling Activity (LIRA) released today by the Remodeling Futures Program at the Joint Center for Housing Studies of Harvard University. 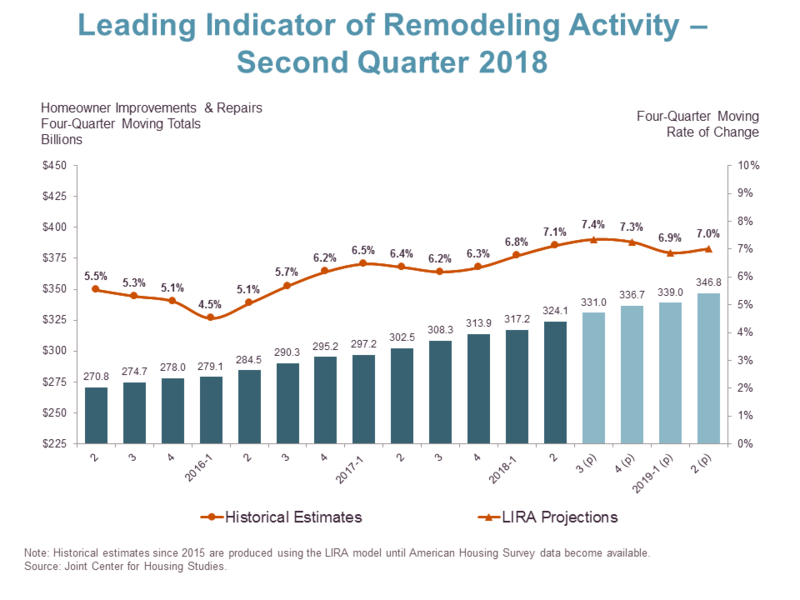 The LIRA projects that annual growth in homeowner remodeling expenditure will taper somewhat in the first half of 2019, but still remain around 7 percent. The LIRA is released by the Remodeling Futures Program at the Joint Center for Housing Studies of Harvard University in the third week after each quarter’s closing. The next LIRA release date is October 18, 2018. The Harvard Joint Center for Housing Studies advances understanding of housing issues and informs policy. Through its research, education, and public outreach programs, the center helps leaders in government, business, and the civic sectors make decisions that effectively address the needs of cities and communities. Through graduate and executive courses, as well as fellowships and internship opportunities, the Joint Center also trains and inspires the next generation of housing leaders. For more information, please visit www.jchs.harvard.edu.